This is Part 2 of the 3DR RepRap Delta printer, in this post we will look at the preparation of parts, how the printer is assembled and string our Spectra Line drives. 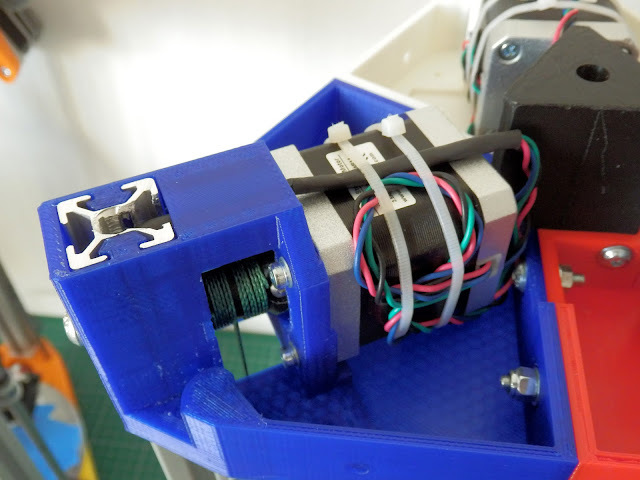 In Part 1 I introduced the 3DR Delta printer, the 3D printed elements and a list of the parts you would need to source, to build one yourself. The response to this printer release has been tremendous, a big thank you to everyone who has contacted me, and the many people who have already printed a set of parts and even made modifications. 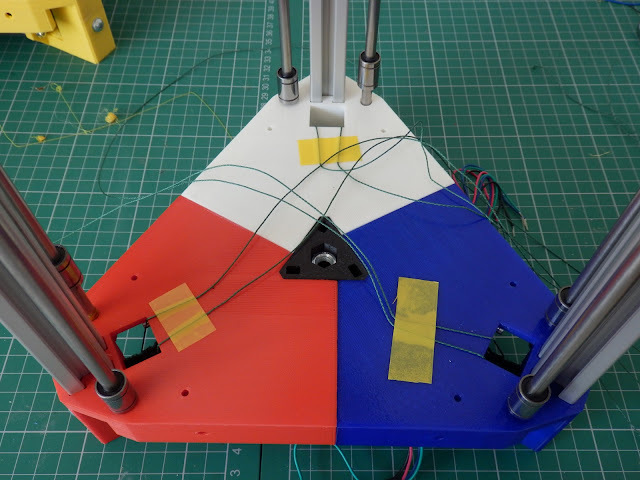 I feel this is exactly how adding something new to an open project like RepRap can and should bloom out into the world, thanks so much for all your enthusiasm and support. One aspect of the design I did think ling and hard about was the use of t-slot Aluminium extrusions, they are now quite common and can be sourced from a number of manufacturers around the world, but it was not my first choice and only drove me down that route when my local DIY store could only offer me much more expensive 20mm Steel box. 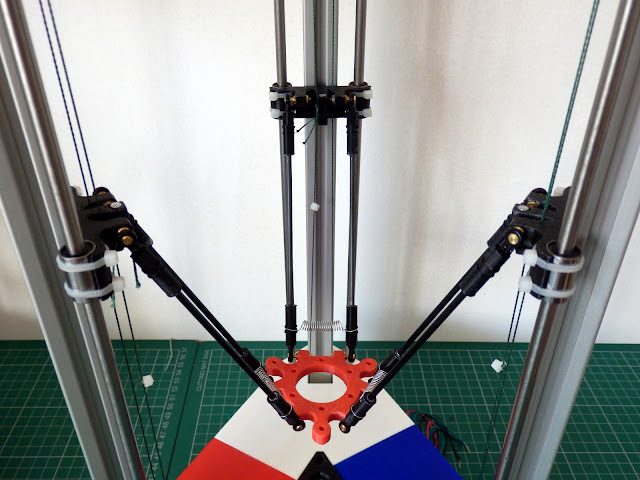 It's clear from the response that some people will find it hard to source these extrusions in various places in the world so it's really great that Nicolas Arias posted the start of a 3DR build shortly after I released the files with a simple modification to allow the use of standard 20mm box. Photo credit - Nicolas Arias - 3DR modifications to use standard 20mm box Steel or Aluminium sections. 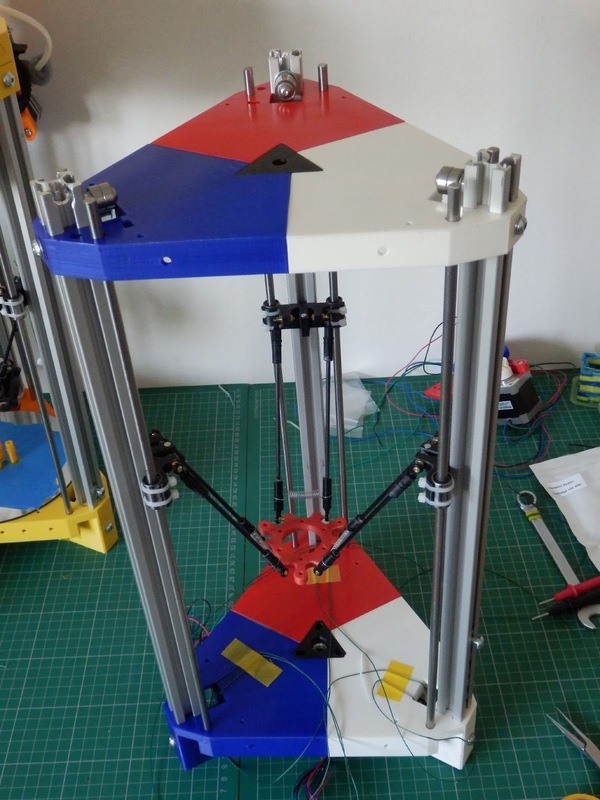 Nicolas is making great progress along with many others that have contacted me and sent images of 3DR parts, I'm really pleased to see people are printing these big parts without warping, I did spend quite some time making sure they should print well. 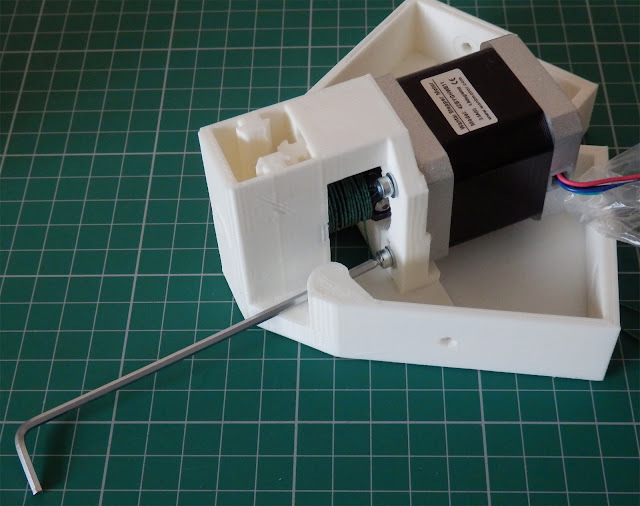 And thank you to the now various people around the world who are converting the original Sketchup 3DR models into Solidworks, OpenSCAD and other formats to make it even easier to use and evolve. "Is a Delta or 3DR, better than a traditional machine?" - They both have good and bad points, Delta's need to be very carefully setup, they can move very fast and the carriage / head can catch on things if it's not all perfectly measured and calibrated in firmware, but once it is, they are fantastic! "Would you recommend a Delta or 3DR for a first 3D printer / for a beginner / for my first build?" 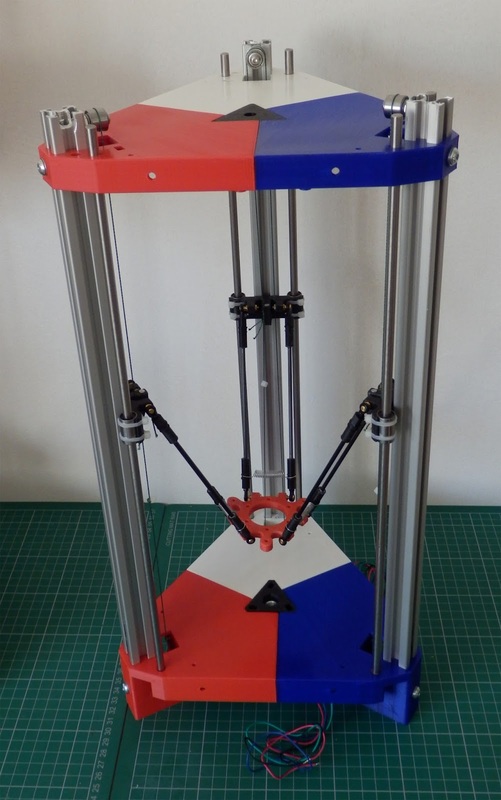 - See above, and generally I always recommend building a first machine from a kit with an established build-base of users, so I will generally point people towards a Mendel90, Prusa i3 or a threaded rod based Mendel variants to get started, then you can print out a 3DR or whatever else you need. 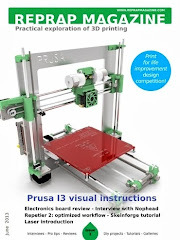 "3DR does not have a heated bed, so can I still print X???? with it?" - Probably, yes. I didn't want a heated bed. 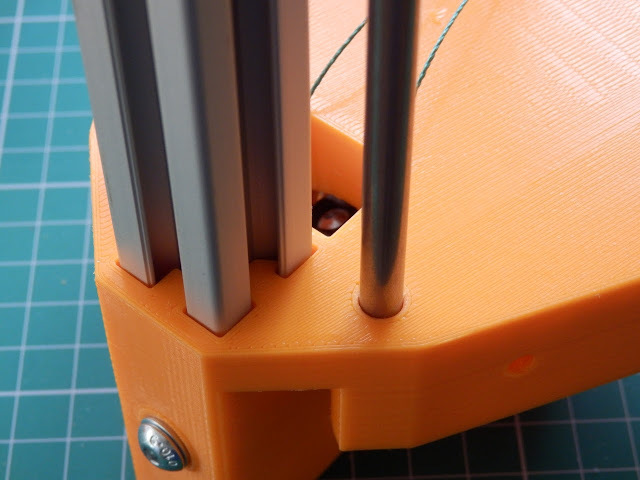 The tiny detailed and super fast prints I achieved with my Tantillus really made me think about all the problems a heated bed causes, It's actually quite easier and quicker to print many things without a heated bed. 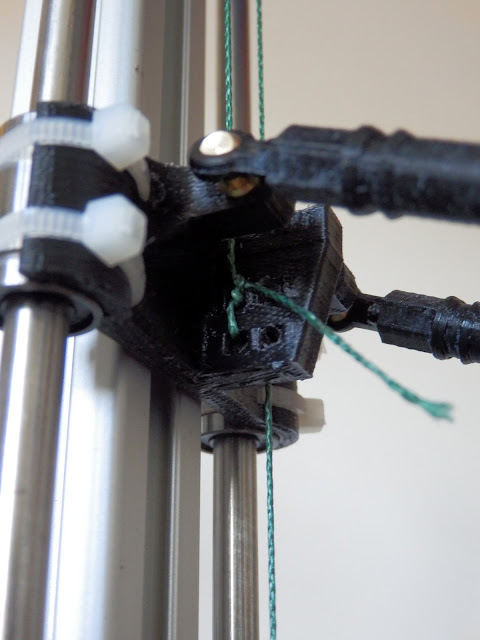 Works well for PLA, don't even try to print ABS on a non-heated bed machine. "Do you have / can I have an exact BOM?" - The list in Part 1 is as good as I have at the moment, a more exact BOM would just state things like "Take three of these, I had in a box in my Garage" - I'm doing my best to find sources for things you could use, feel free to innovate or post good suppliers or modifications etc. 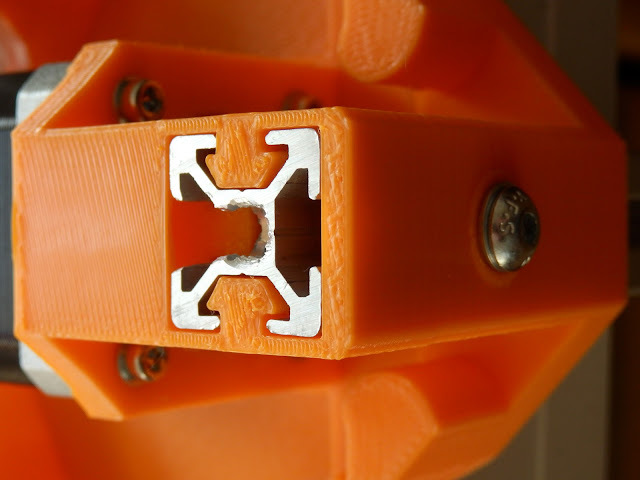 "Can I print the Hot-end adapter in PLA?" - I always fan-cool my thermal-breaks on my hot-ends, it's just a good idea, so they can be PLA. If you don't plan to cool, then do think about using ABS for the hot-end mount and the main carriage. 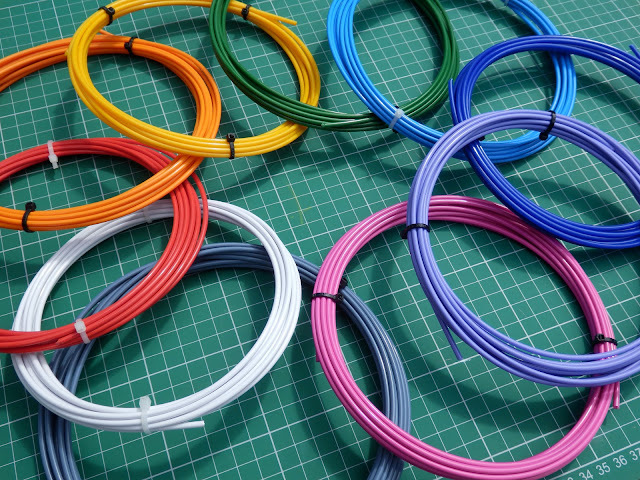 "Can I use 3mm filament? 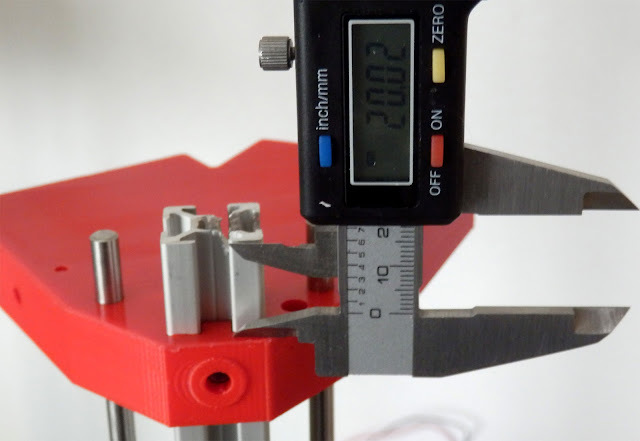 or why did you use 1.75mm filament?" - I just prefer 1.75mm for Bowden setups, but 3mm should work, just be careful how you mount the extruder so the PTFE tube has enough room to move and not pull the carriage over. "How the? what the? 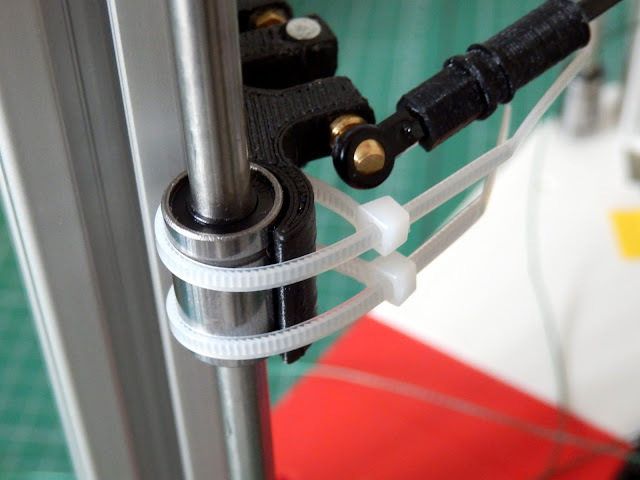 does the filament idler work?" 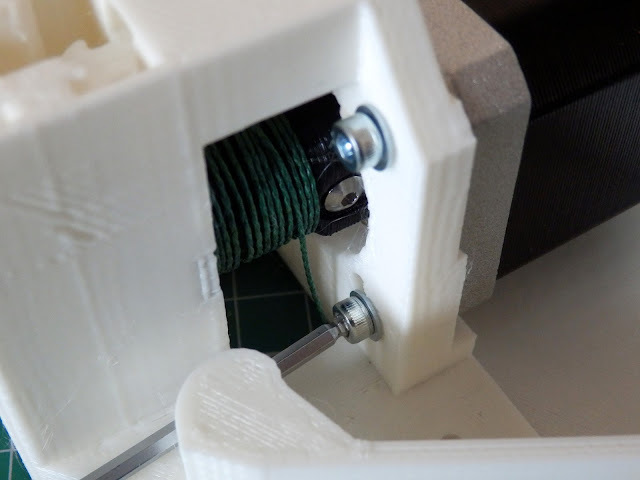 - Yea sorry about that, it's quite simple and clever really and I should have mentioned it in the first post, see below and it should become clear, it's just two bearings that you can also slide up and down to tension the line. 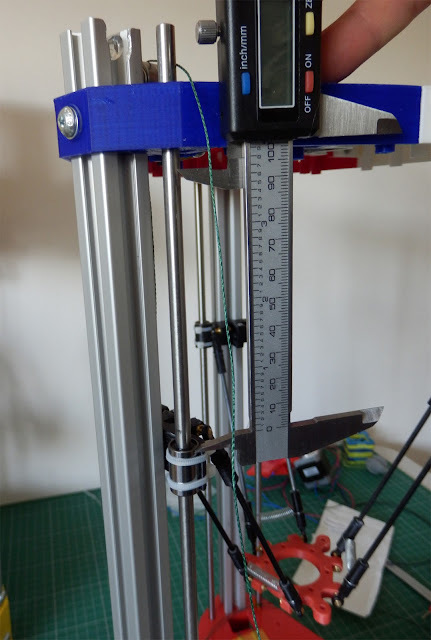 "Can I use X instead of the 3mm carbon rods" - Anything stiff and light weight really, I was going to use 2mm rods but found them hard to acquire, I had some hollow 4mm fiberglass kite rods but decided on solid 3mm carbon for the first machines, they work very well. "What's the distance between eye-to-eye on the rods" - Good question, it's 150mm from pivot universal joint to joint, they could be anywhere between 145mm to 155mm, it's just essential they are all the same length, the exact size can be tuned in the firmware. 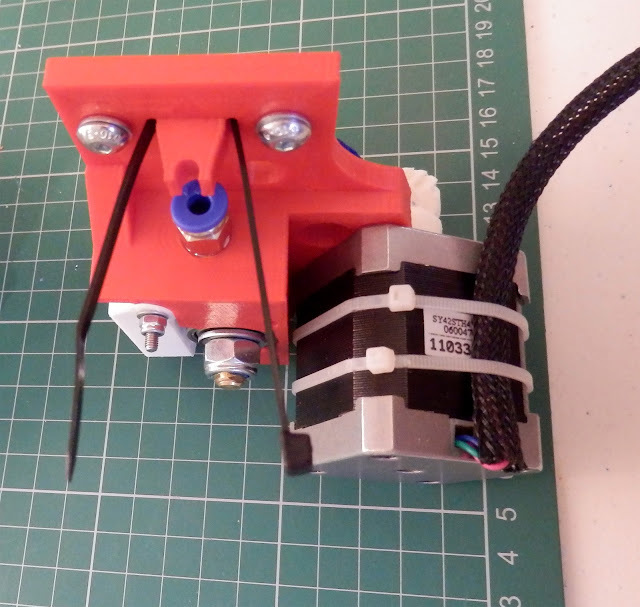 "Can I use other electronics and do you have any other mounts for X" - yes whatever you like, I just wanted to have a 3 Extruder set of electronics with a separate LCD and SD card. I would have also designed it around Megatronics but the SD card is mounted on the main-board and not on a 'display'. Rumba just fitted nicely and had all the features I required. 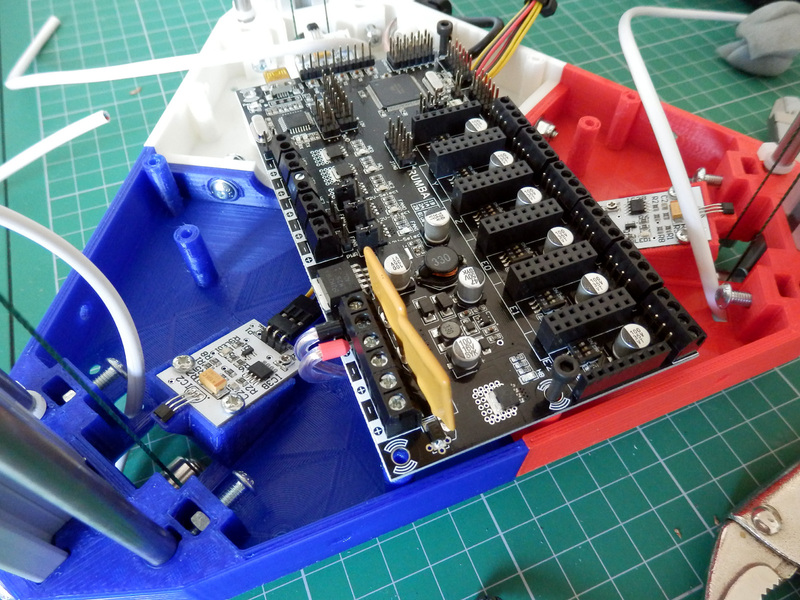 - I don't have any other adapter plates ready yet. 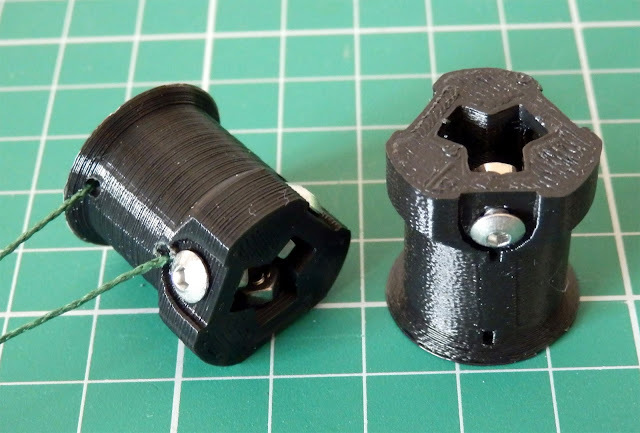 "It's hard to print the rod adapter mounts vertically" - It's not essential to use the adapter, I just wanted an easy way to fit the universal joint and rods together, you could drill out the 2mm hole in the joint to 3mm and push the rods straight in. 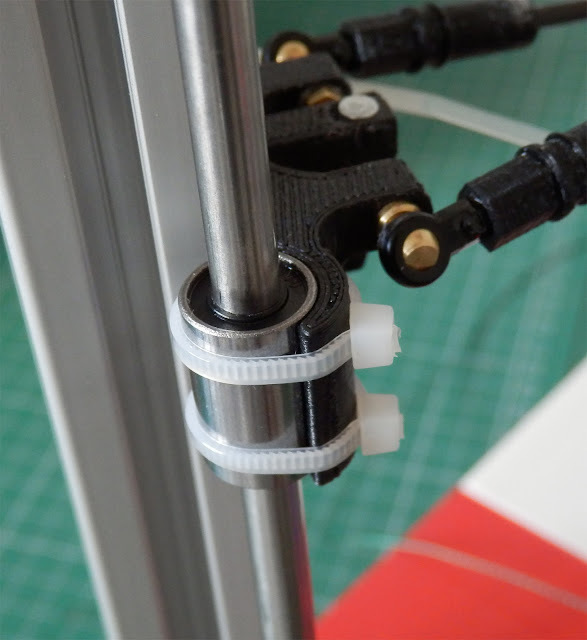 I have already had a horizontal version of the rod adapter sent to me by Luke Turner, so if this is a problem for you let me know and maybe we can see if Luke can upload & share. 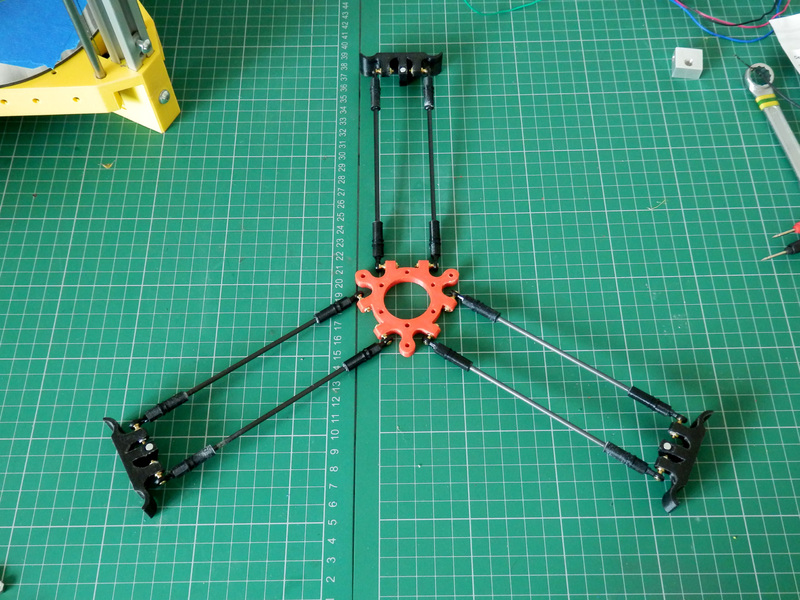 "Is 3DR scale-able?" Yes, easy to go taller, just needs some thought about rod length. To go wider you will need to consider rod sizes. 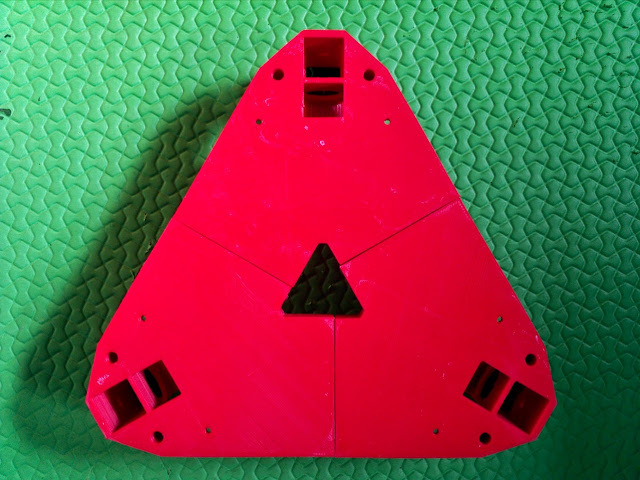 I always intended to be able to insert another printed part (spacer) and a new bigger middle triangle to get an overall bigger build area with the same parts. 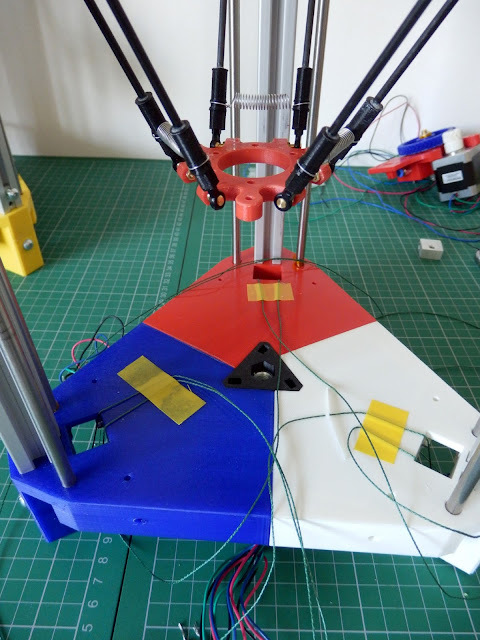 I actually wondered about keeping the size smaller to start with and doing extensions that could be printed out in order for it to be able to self reproduce, but that was getting messy. 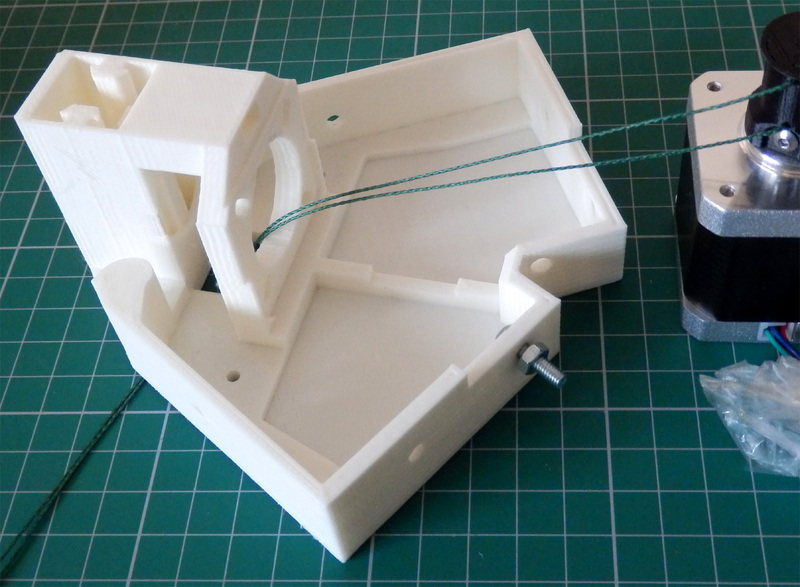 Drilling out the holes for the motor cable management inside the extrusion. 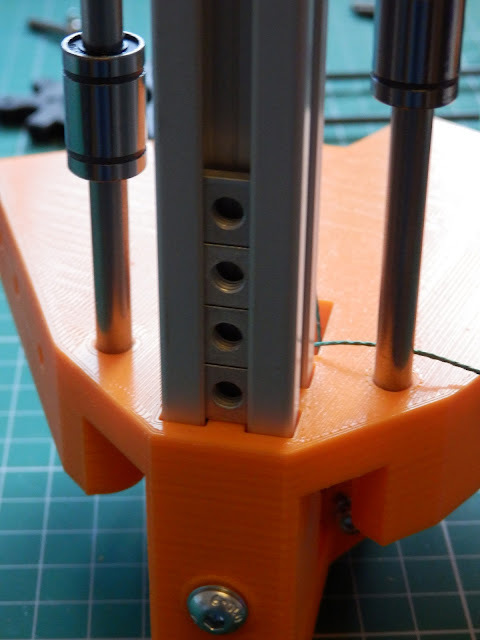 I don't actually like this bit of the design, what I should have done was to make the motor mounts taller or not have the Aluminium extrusion go all the way down so drilling holes in the extrusion for cable management is not required. You can do this if you like or make changes so you don't need to. It's nice to have the motor cables hidden, but a Definite area for refinement. Really important bit! 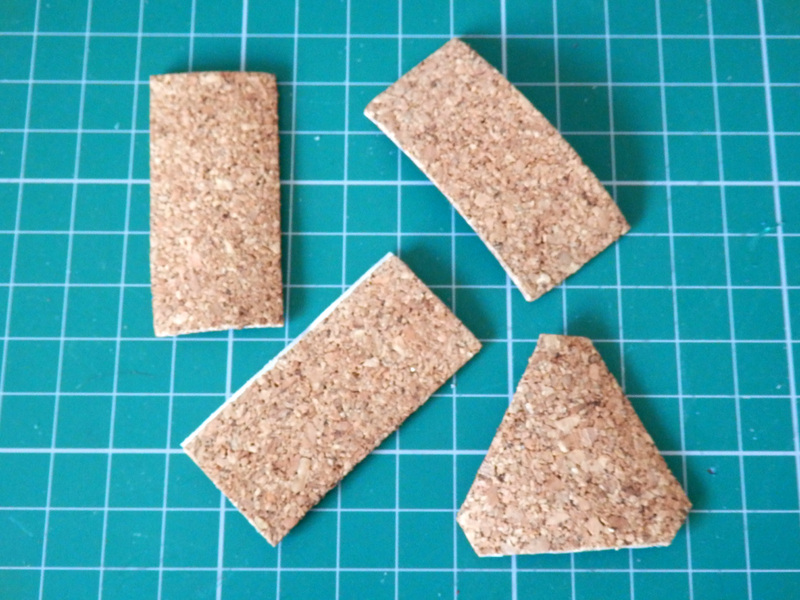 - Please make sure you get the magnets the correct way around before you glue them in place. 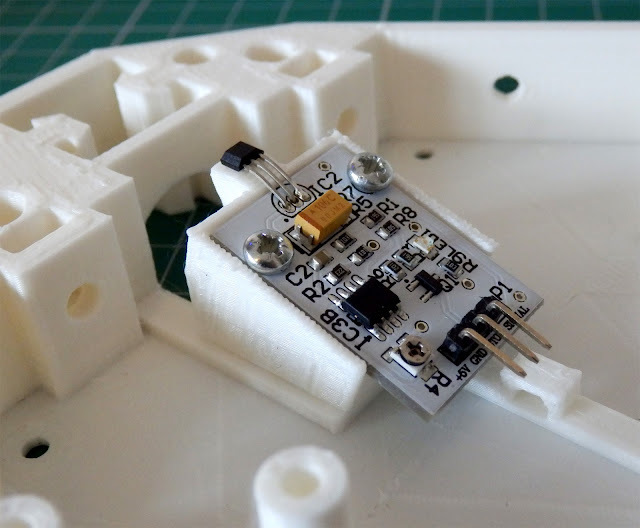 the hall-effect sensors will only work with the magnet one way around! You may need to test to get the correct orientation. 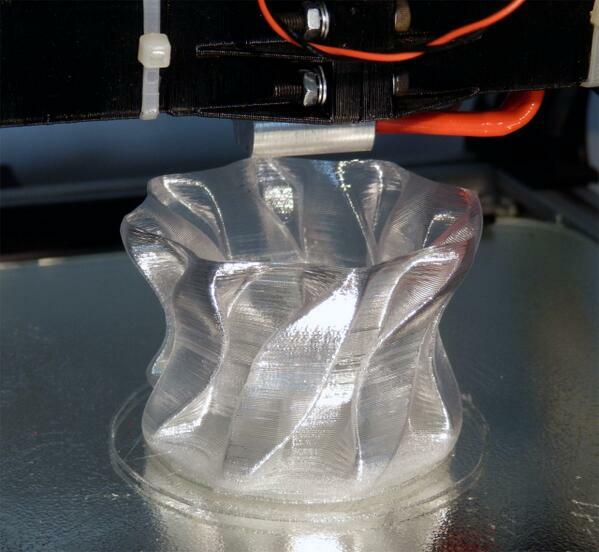 Another challenging print, you need good Z alignment and use of fine layers will make the filament spools print well. 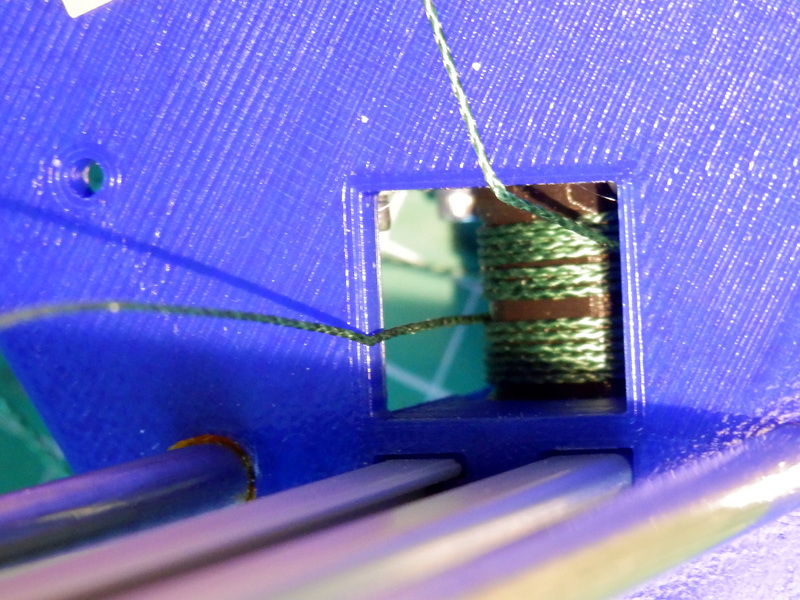 also check you actually have a filament hole going through the spool, if yours are a little filled, drill out with a 1.5 drill. 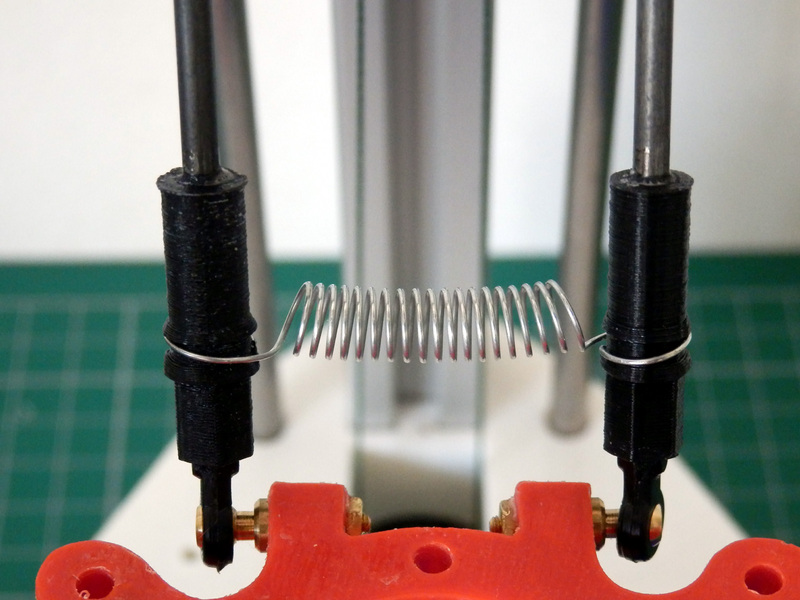 Use 6mm M3 screws, ideally domed for the filament spool to attach to the motor shaft. M3 nuts go inside and should be tightened equally. 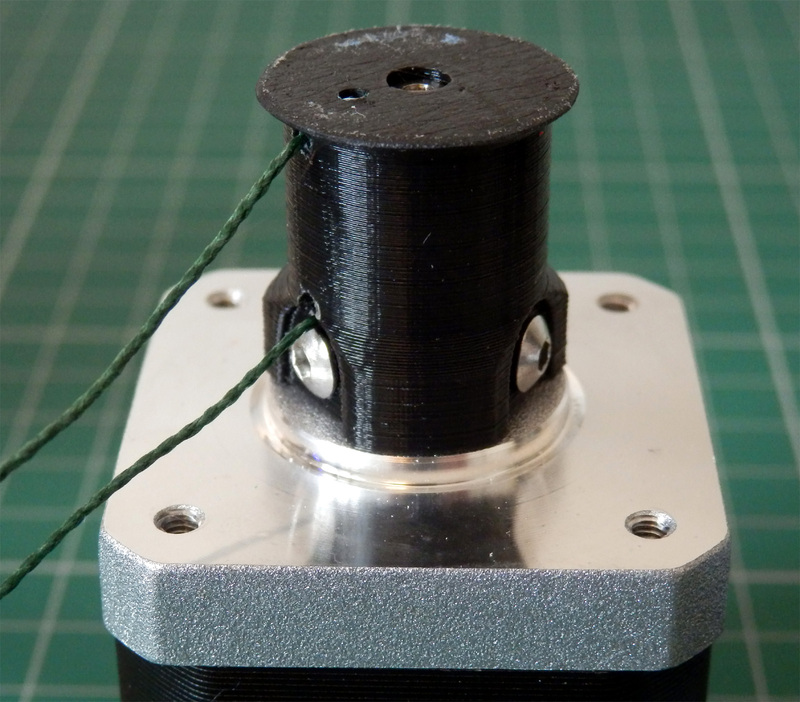 The spool should be fitted so it's almost touching the motor body so it just fits when fitted on the motor mount. Before fitting your motor's with the spool fitted to the motor mounts you will need to wind the Spectra-line. Use about 2M of line, guide it through the middle hole and out each end to the spool centre, then wind in this direction 7 turns each side. Hold the wound spectra line in your fingers and push the remaining ends through the motor mount hole. Keep them tight on the other side as you position the motor. 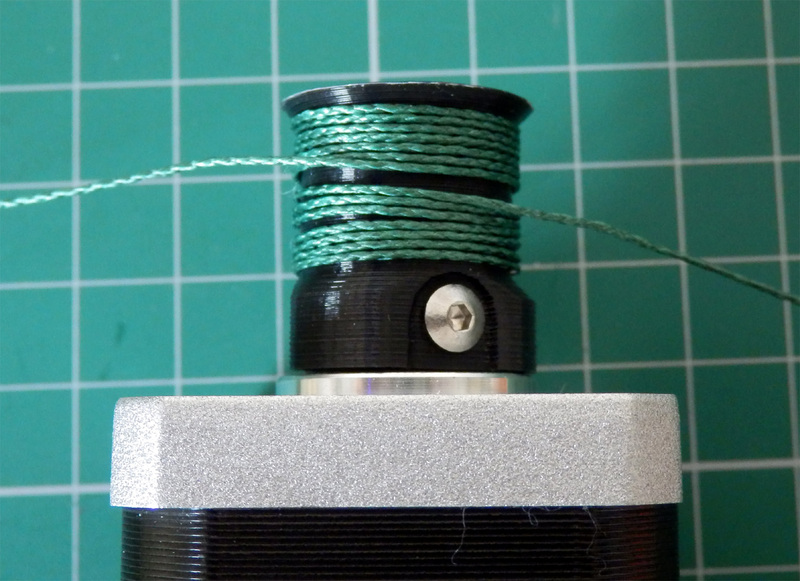 Use some tape to keep the spectra-line tightly wound and tidy. 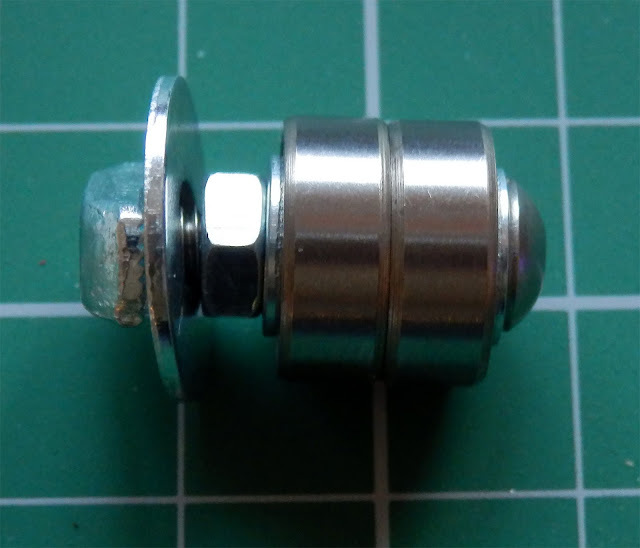 Then use 4 x 10mm M3 bolts and washers to fix each motor. 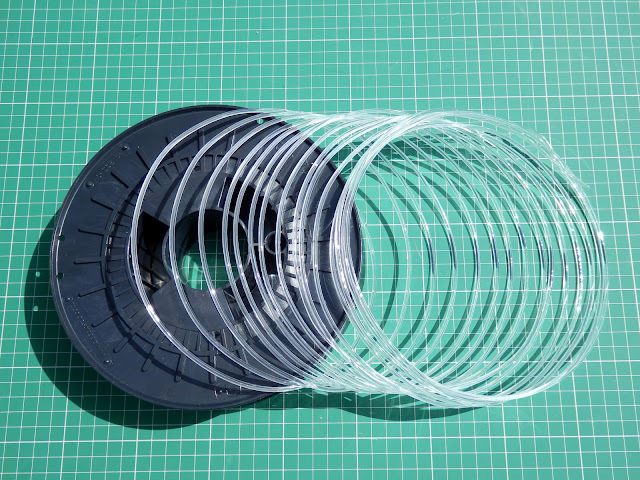 Check the filament spool is clear of the plastic, it should fit nicely into the small round recess in the plastic frame of the motor mount. Slot 6 x M4 nuts into the bottom and top centre boss sections along with an M8 nut in the top boss. 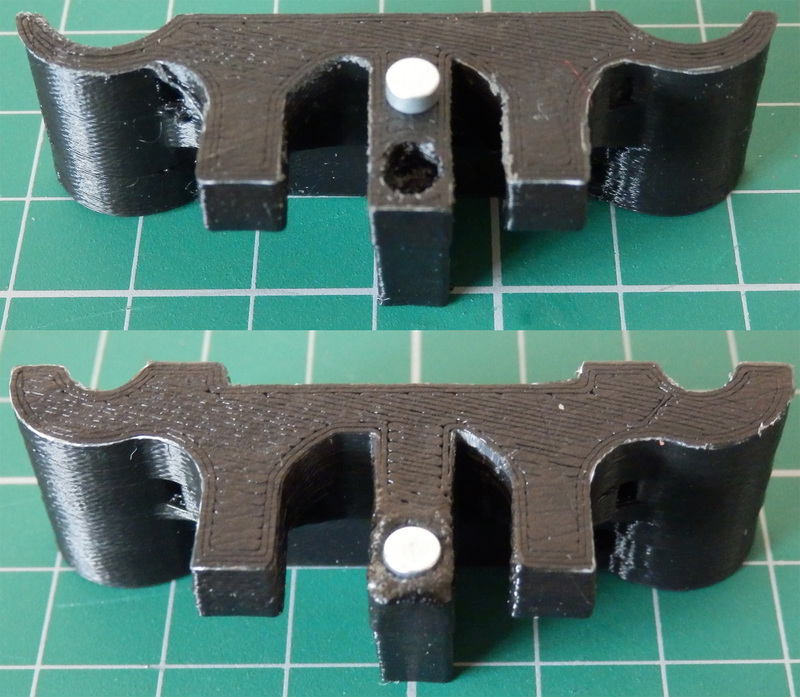 You don't need to fit the M8 nut into the lower motor mount, but fit one if you like. This was from a thought process about having a rotating bed ( polar bot) option, the only reason I didn't remove it was if I needed to raise the middle of the platform, you could push it up with an M8 rod or set screw, I didn't need it. 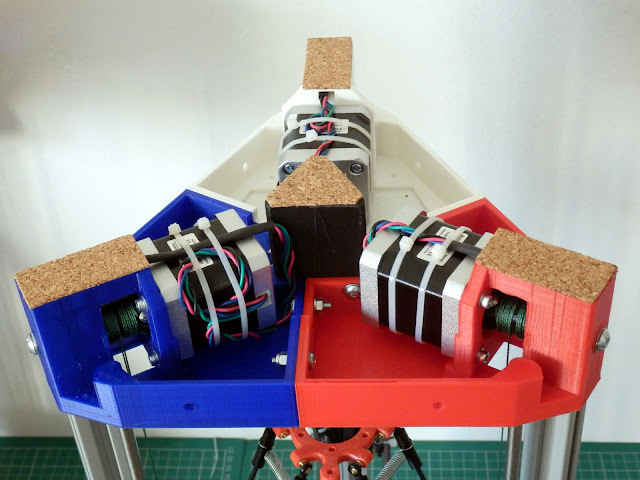 You should have a set of three motor mounts assembled with spectra line on the spools. 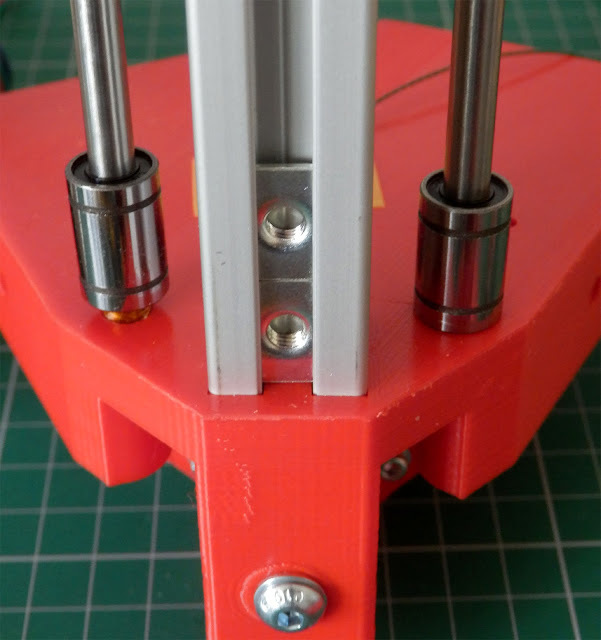 Insert an Aluminium tube from the bottom of the motor mount, you may need to clean up the first layer if it has made a small lip on your print. 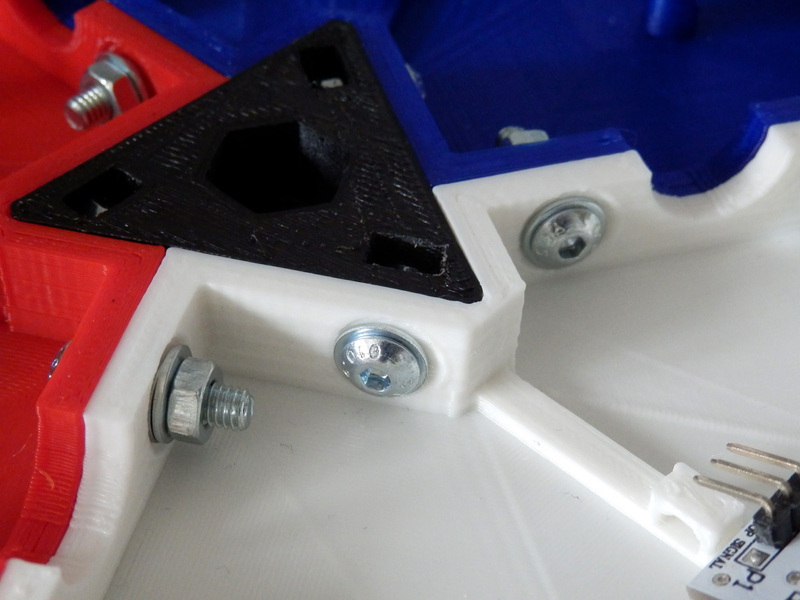 Fix the Aluminium to the frame with M5 bolts into a t-slot nut or M5 square nut. 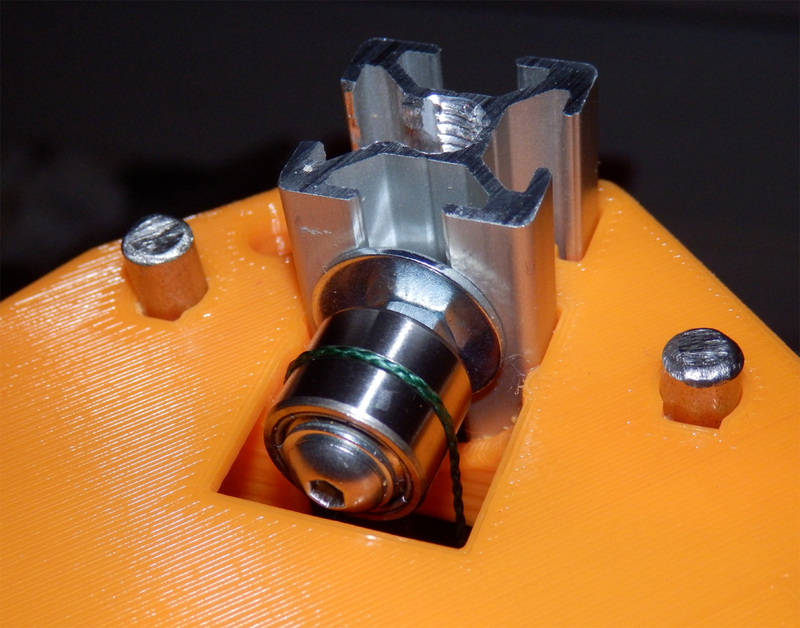 Slide 6 LM6UU linear bearings or bushings on at this point before you forget. 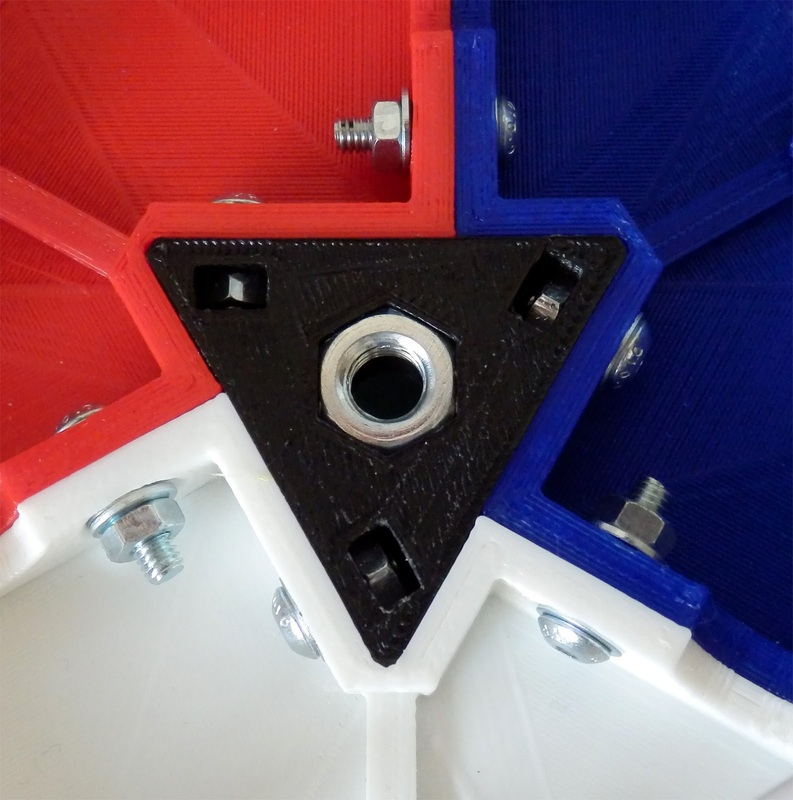 This is also a good time to add at least two extra T-nuts to the outside of each frame, you can mount extruders, fans and other things easily after it's built. They should end up flush to the bottom of the plastic mount (unless you have decided not to cut the slots out of the Alu). 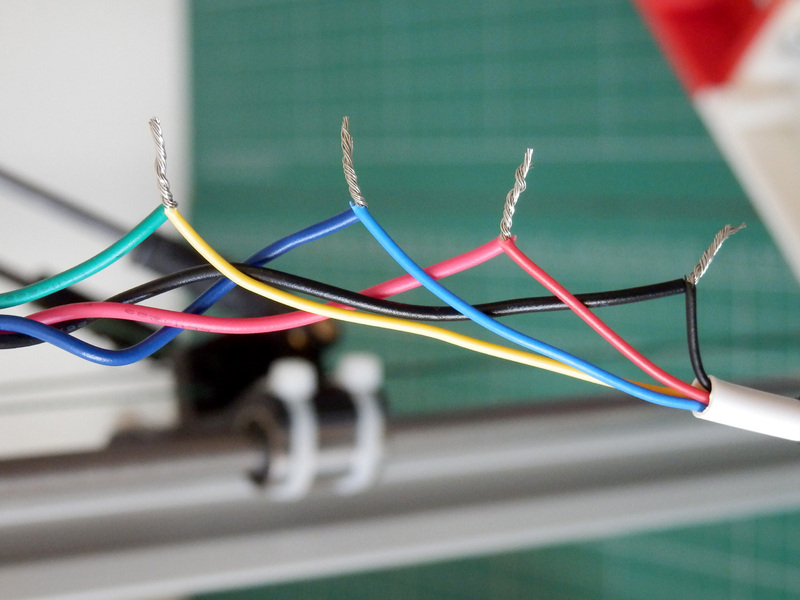 If you have short cables on your motor's extend them and remember to use a cable that can fit in the middle section of the Aluminium extrusions. 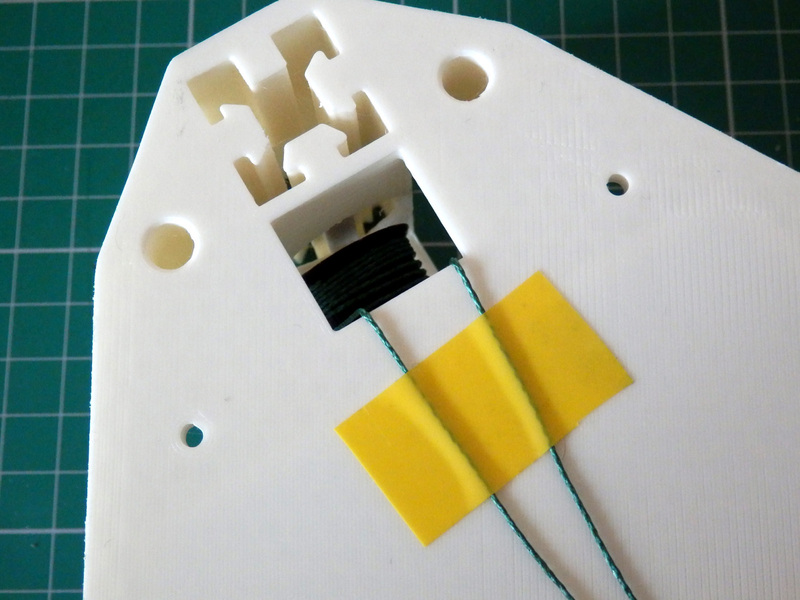 Cable tie the motor wires to the motor body giving you some slack, and feed through the motor mount hole. It's a good idea to tidy up each of the motor cables and feed them through the Aluminium. If you are confident with your wiring and you want to make it neat and tidy, cut some sticky backed cork or rubber / neoprene. 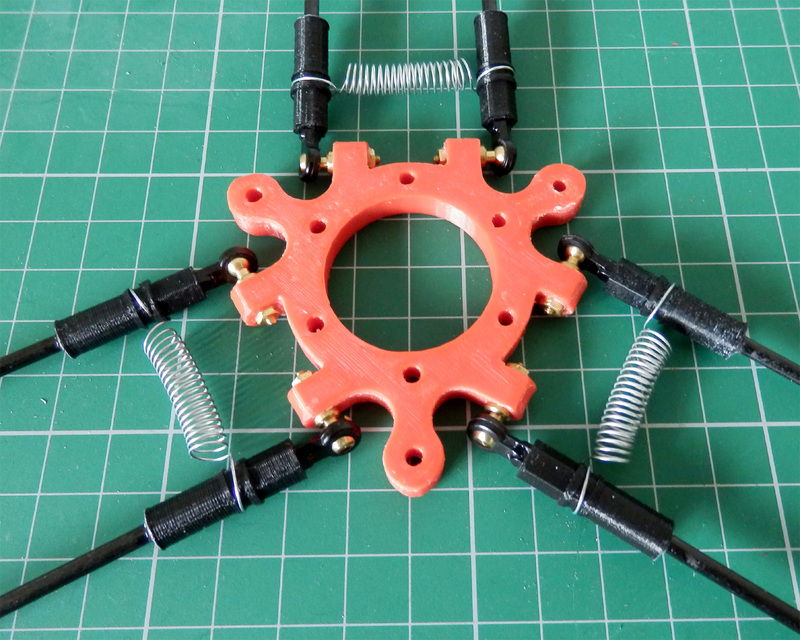 And stick to feet, and optionally the centre boss - cuts down on vibration, not that 3DR has much anyway. 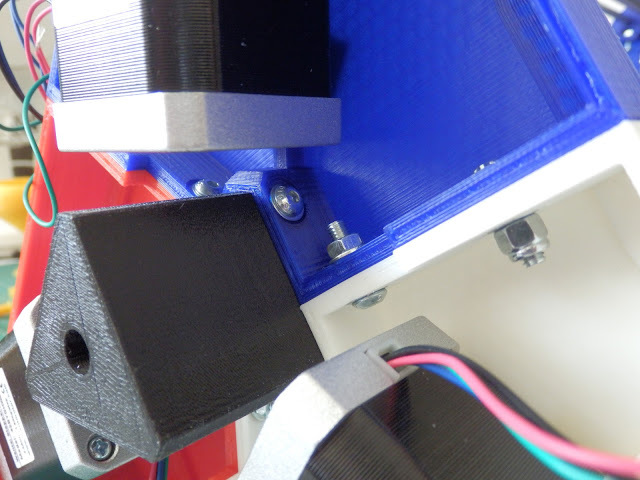 For the top sections, you can screw your hall effect sensors down at this point using M3 x 12mm self-tapping screws or you should also be able to use standard M3 bolts with a little more force. You can now slide the Aluminium and smooth rods onto the top section. 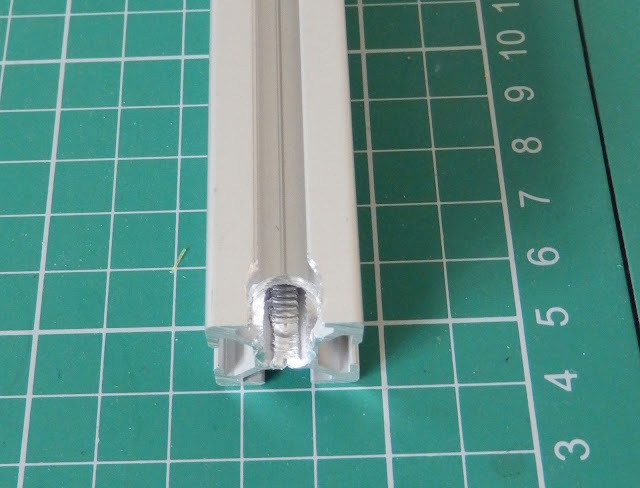 The tops of the Aluminium extrusions need to be around 20mm above the plastic surface so you can adjust the spectra line tension, you can make it smaller, just get them all the same distance and check the cover cap fits. 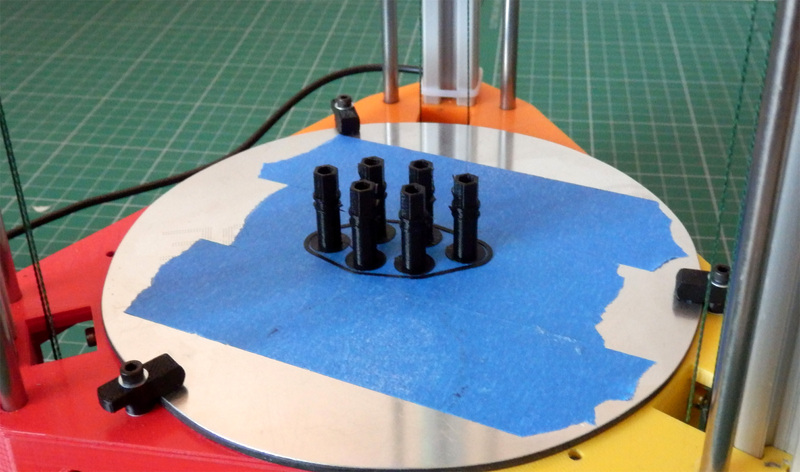 - The cover cap fitting will get tighter after we install the idler bearing. Make up three sets of Idler bearings for the Spectra line, try to use the same type of domed bolt, washer each side (not in between the bearings) an M4 nut and M4 penny or M5 washer - if you do that it will also grip the printed cover cap nicely. 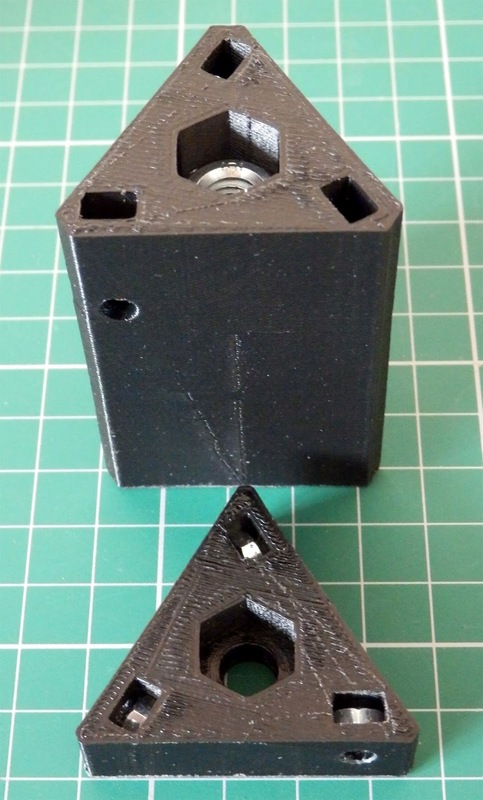 - The bearings are 2 x 624ZZ types (13mm outside and a 4mm hole) you can use whatever size fits, but I doubt 608's will work and won't fit under the printed cover cap. 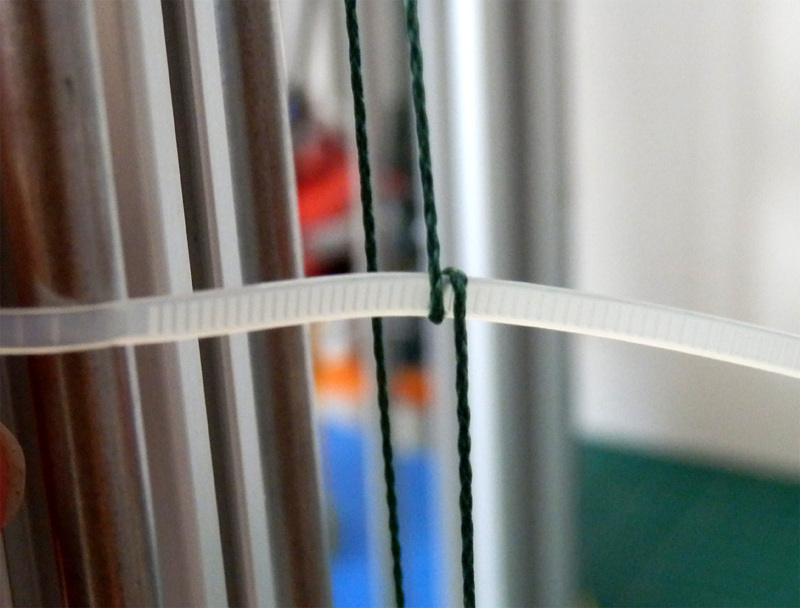 This allows the line to be tensioned very easily. 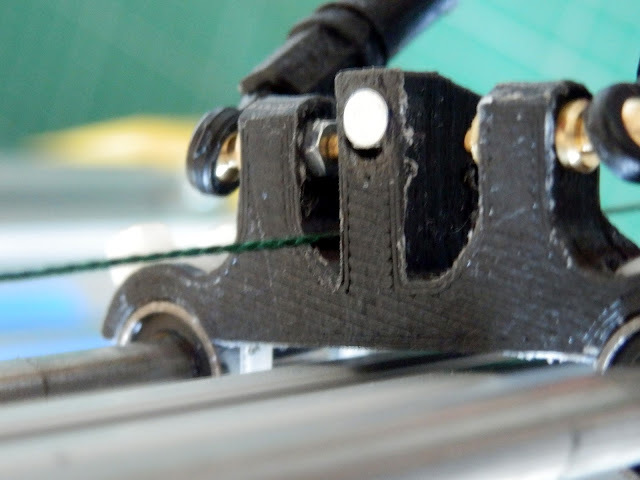 If you are not using T-slot Aluminium you may need to cut a slot so you can still use this method to tension the line, it's well worth while doing as you want nice and tight lines for printing, and trying to adjust them on the carriages is not easy. When first fitting the Idler, make sure it's down as low as possible, but so you can still use the Alan key later on to tighten the line. Ignore the spectra-line at the moment - we will look at doing that a bit further down the post. 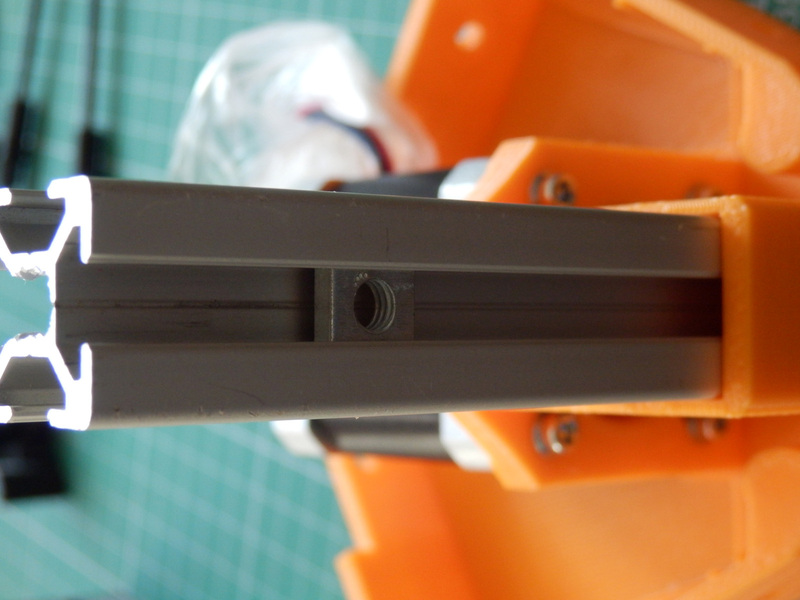 You can then route the motor cable down into the underside of the top section. Next step is to make the carriages and then get them stringed up. Time for a tea break and a biscuit. The poor continuity of a carriage change from black to Orange... I would never make a film director. You can add anti-backlash springs if you like, they are not essential and depending on the quality of your joints may not be required at all. 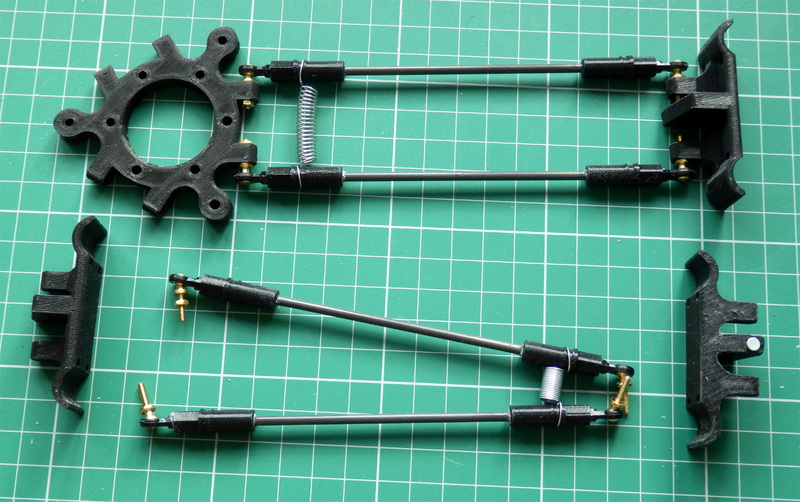 I'm interested to see how the all joints wear down with one 3DR machine fitted with springs and another without. We will see. Great! - That's most of the mechanical assembly, now a little tricky part - threading the spectra line. All your line should still be nice and tidy and stuck down to the platform, don;t remove any tape just yet. 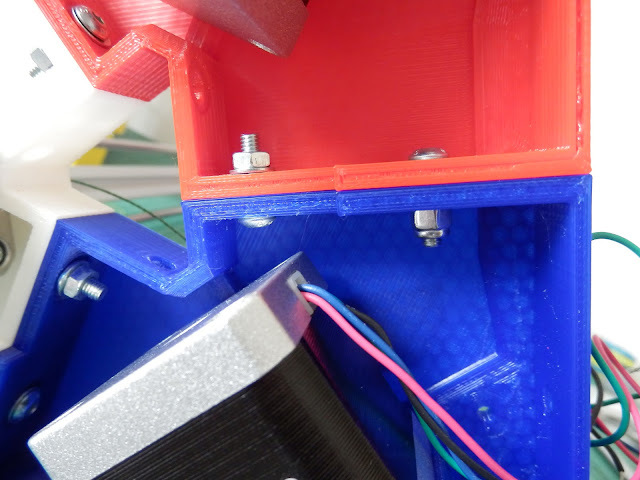 Step 1 - Take the spectra line end closest to the Aluminium extrusion and shown on the left hand side above. Leave the other end of the line stuck down. Move a carriage so it's about 100mm away from the top, it does not have to be exact, just about this distance. It's not important if the carriages are placed at slightly different heights, all we are doing it making sure the spectra line can wind and unwind well enough. 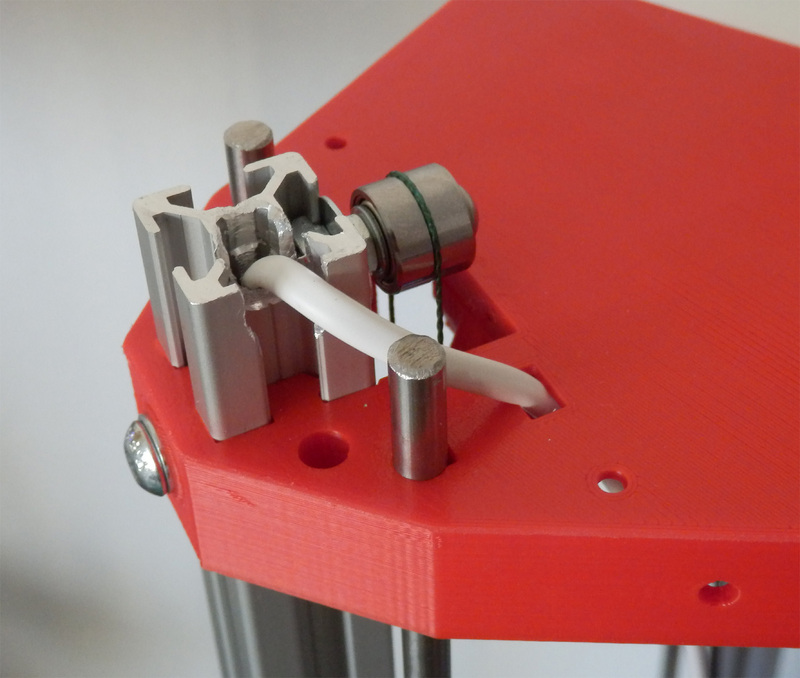 Step 4 - Go around the idler bearings and back down to the carriage. 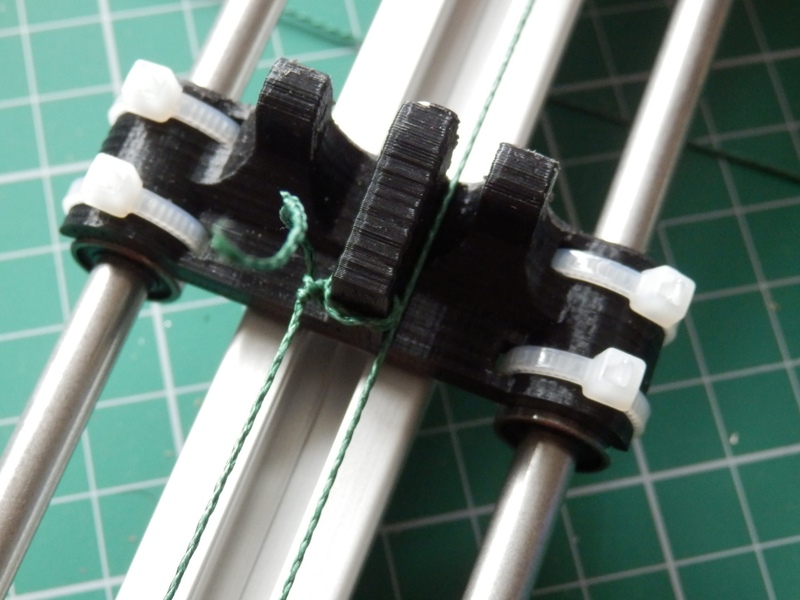 Step 5 - And secure the line tightly to the carriage making sure the line runs up the other side as shown above. 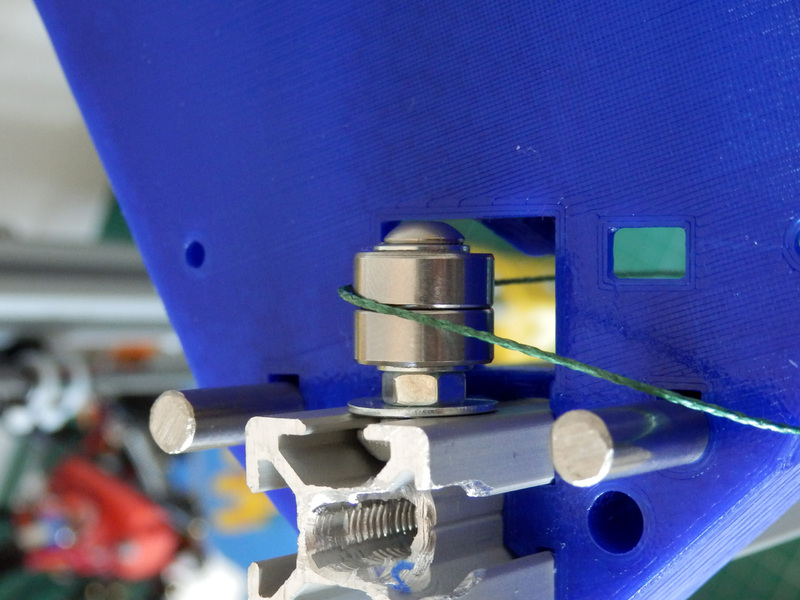 Step 6 - Then you can take the other end of the spectra line and secure to the bottom of the carriage, trim lines to size. 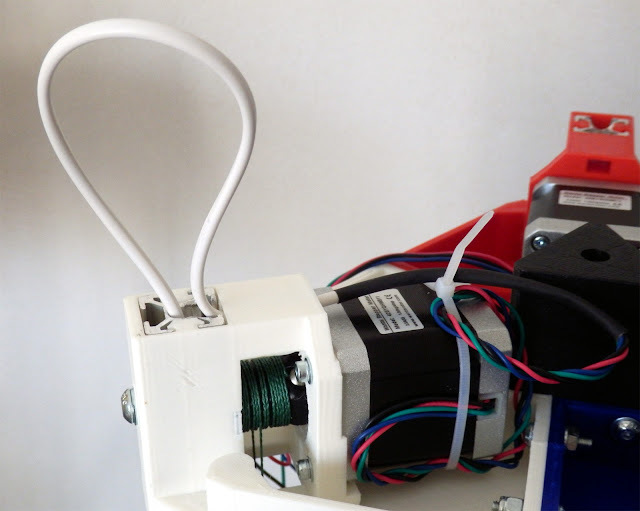 It's very hard to get the spectra line really tight and we want to save out top idler adjustment and tightening for after we have moved the motors a little as they will slacken off after about 10 cycles up and down. The above use of a tie-wrap is a little trick for shortening the spectra line easily, just spiral the tie-wrap and straighten then do it up and trim. 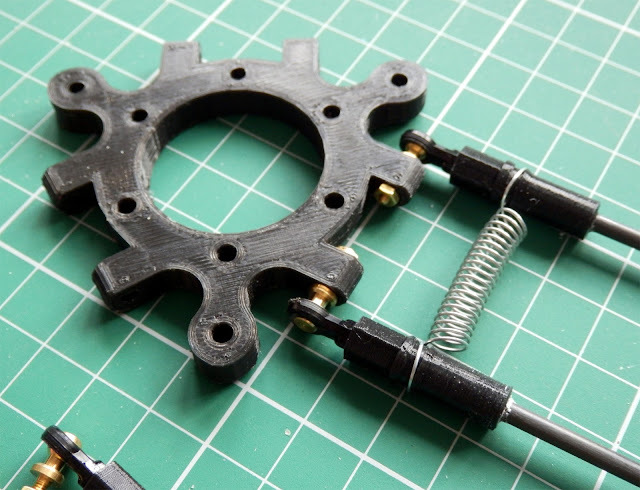 Now your lines should be quite tight, we can make them really twangier later with some idler adjustment. 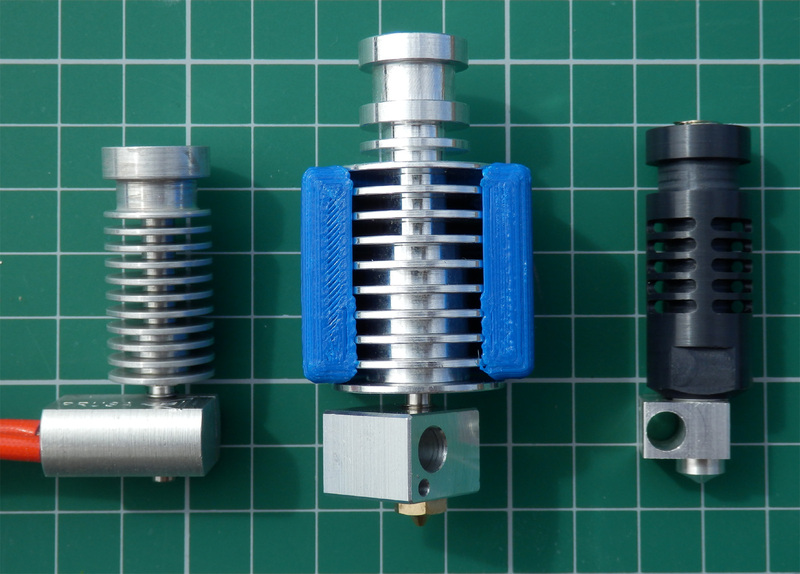 The 3DR extruder is almost identical to the design I did for my Rostock, it has the herringbone gears and Pneumatic push-fittings - Always try to use a 1.7A or 2.5A motor for your extruder. 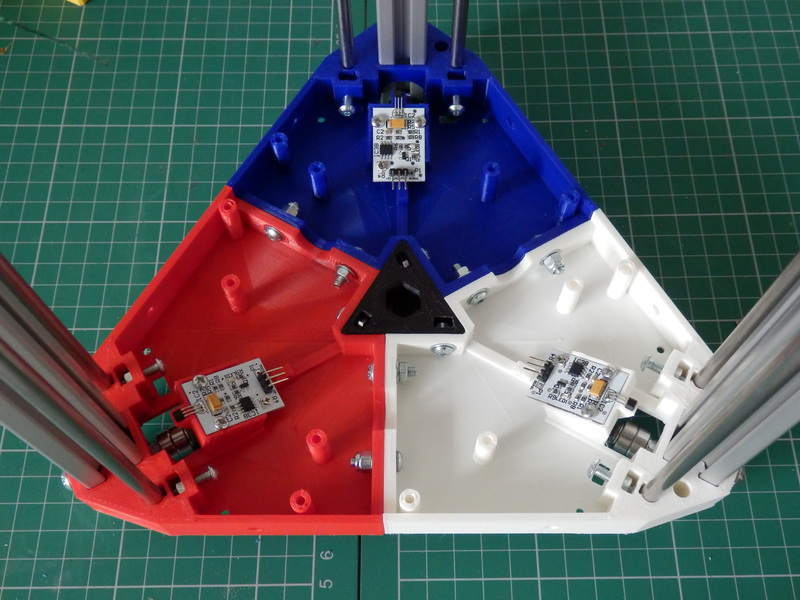 And just because I know I'll be asked loads of questions about how the electronics fit, in the next week - here is a quick shot of the RUMBA electronics and how they mount, More on the electronics, wiring and hot-end options in Part 3. 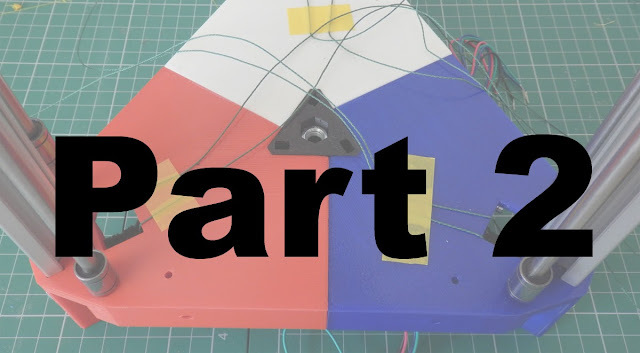 I hope this post answered a few more questions, that's just about it for Part 2, Part 3 is coming really soon, I won't make you wait too much longer. Keep up the 3DR builds everyone! 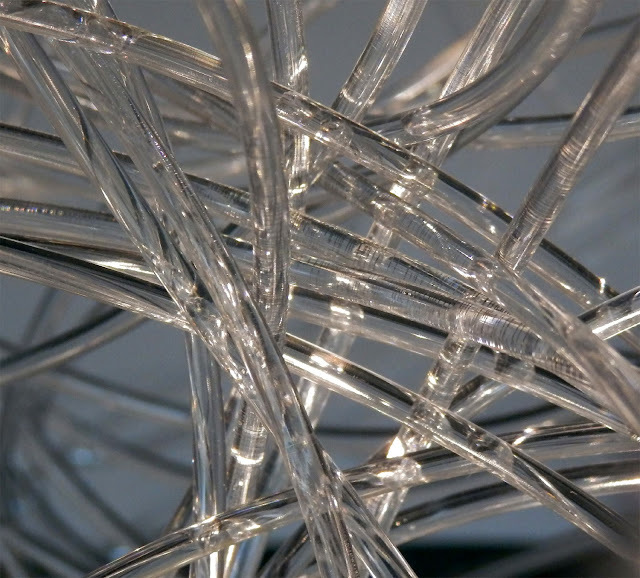 I have been doing a lot of printing with the new Taulman t-glase material for the last few months (it's a special PETT plastic-fantastic), I'll do a full blog post on it soon. For the first 20 mins I had the roll, I just photographed the raw filament, wonderful stuff! And some samples of Colorfabb PLA/PHA material also in 3mm - nice and bright colours. 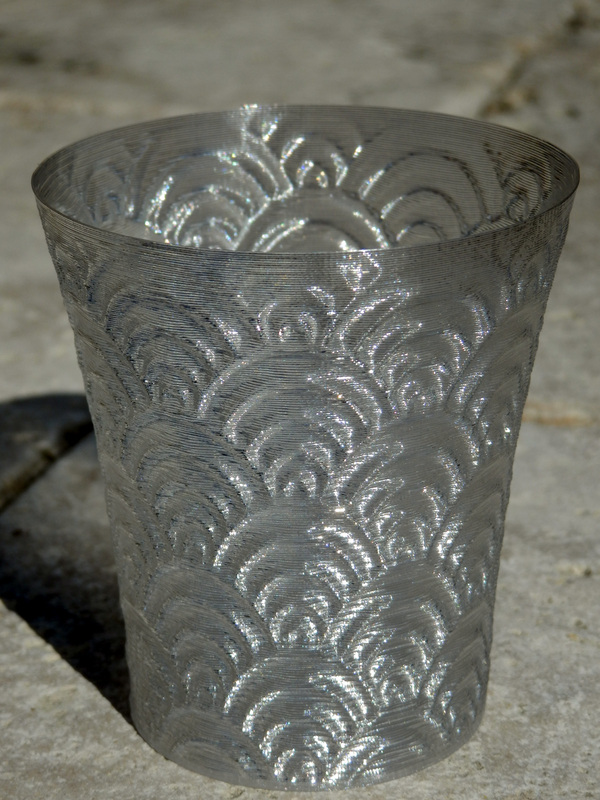 This was a first print with the Prusa V2 nozzle and Colorfabb_XT material - Stainless nozzles do seem to like PET materials, keeps them very shiny and clear. I made some Links for the PrintToPeer 3D Sculpture/Canvas/Mosaic, these were done by mixing ABS, not something I had tried before, they worked very well. 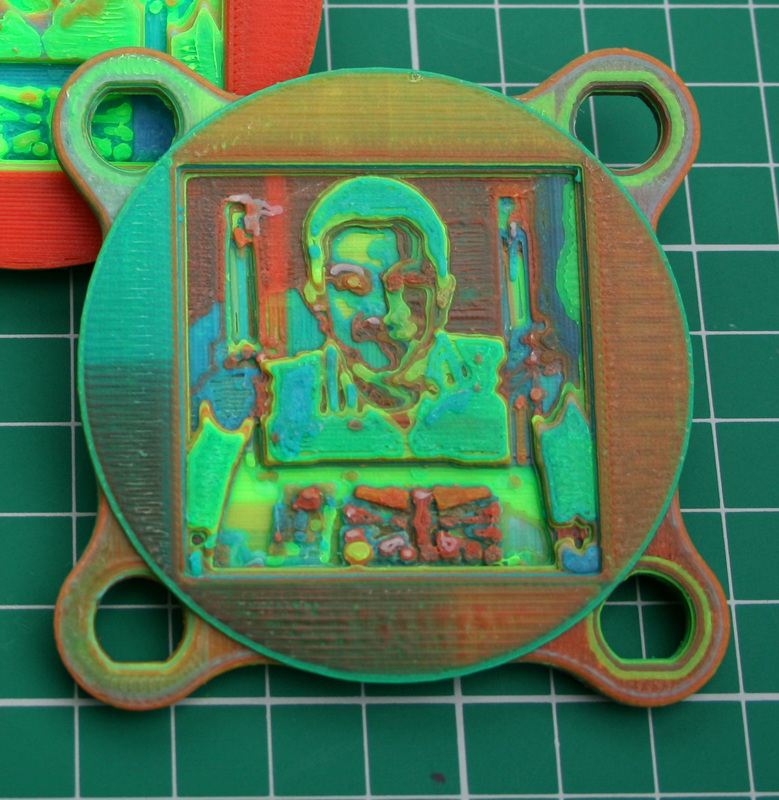 They are Lithophanes so need to be held up to the light to see all the detail, but in this one you can see many of the layers picked out by the mixed plastic. This one above was my most complex colour mixing print ever, it has 52 layers and every single layer has 8 different colour mixes! that's 416 different transitions... I'm only doing one of them! 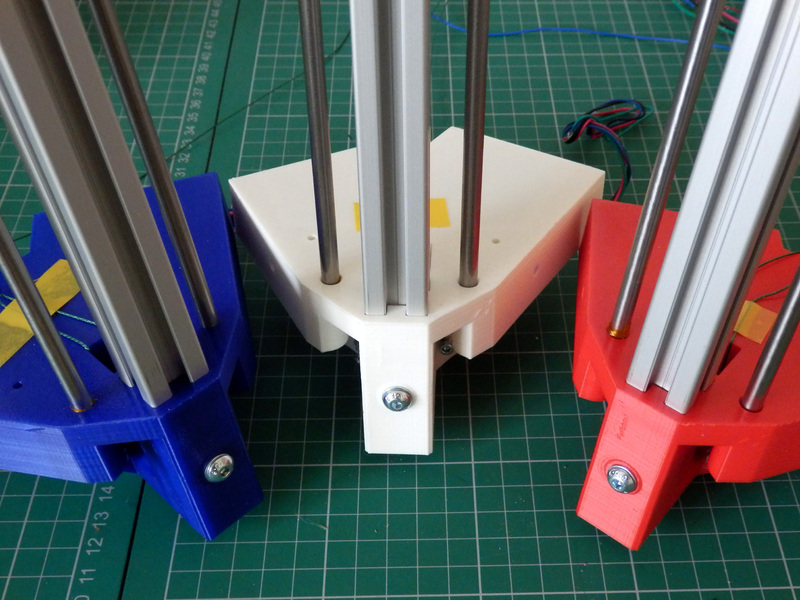 And finally the first set of RepRap Community Hub stand graphics were printed and delivered today - looking nice! 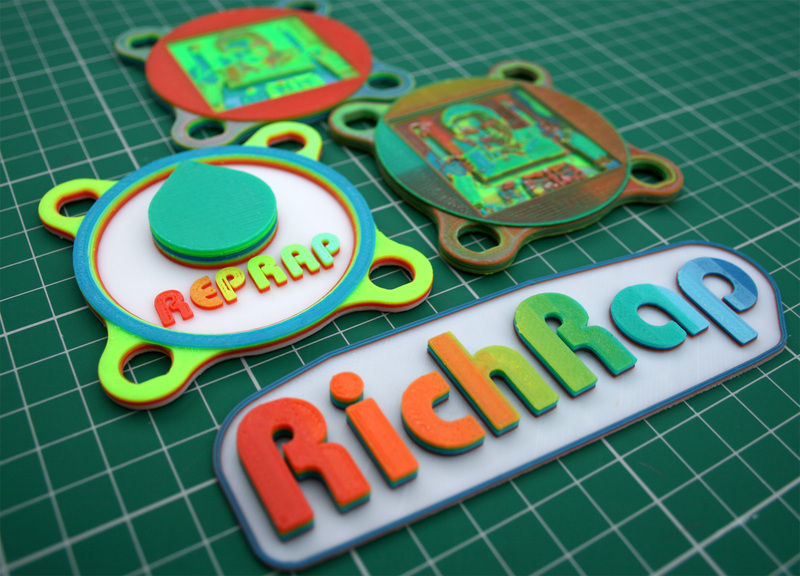 - come and see lots of RepRap People at the TCTShow Birmingham NEC in September if you can.